The Smart Betting Club have teamed up with the Top Dogs Greyhound Tipster to offer a special 30-day trial in a unique Premium partnership deal. 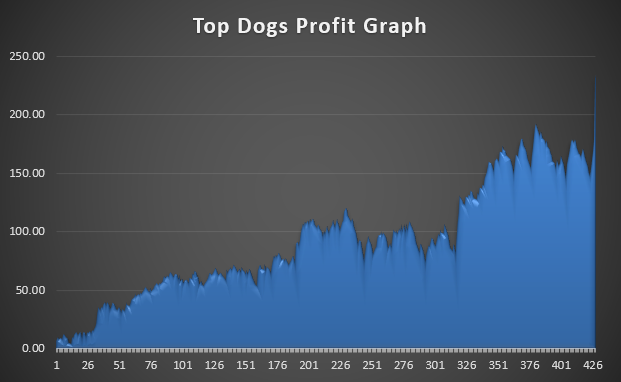 Featuring tips from greyhound betting expert, ‘The Dog Scientist‘, since November 2017 it has made a profit of 233 points at 20.20% Return on Investment. As a Smart Betting Club member you can not only benefit from a 30-day risk-free trial to the service but also receive a complimentary copy of Top Dogs’s very own 80 page ‘Greyhound Wealth Secrets’ e-book – featuring everything you need to know about betting on the sport. Not only that but your first month with the service is half-price at just £19.95 + VAT. The Top Dogs service provides regular and to date, very profitable betting tips for betting on Greyhounds and is based on the shrewd tips as put forward by an expert, known only as ‘The Dog Scientist‘. The Dog Scientist has an extensive bookmaking background and is formerly the head of Betfair greyhounds. He is a full time professional backer, layer and trader with a encyclopaedic knowledge of UK and Irish dog scene. He has been involved with several leading greyhound trainers and has bred and owned dogs himself. Safe to say – greyhound racing is his life! With his combined passion for greyhound racing and insider expertise, you can understand why Top Dogs is so highly rated and has impressed us over its initial 16 month period. To allow The Dog Scientist to concentrate on his betting and tipping winnings, he has teamed up with betting expert, Steve Clark who oversees the Top Dogs service and handles all the day-to-day operations. Steve prides himself on offering a high quality and personalised service, with the focus on making it as easy as possible for you to get your bets on and most importantly of all – achieve a profit from your greyhound betting. Always available via email and his own personal mobile number – 07917 356942, Steve runs a well oiled ship designed for the shrewd punter. The reason I recommend Top Dogs is down to its excellent performance since the service and proofing began back in November 2017. For those of you interested in the potential for Return on Capital (ROC) – also known as Betting Bank Growth then Top Dogs also ticks a lot of boxes here. Currently we recommend two different point betting bank sizes for followers of Top Dogs – Minimum and Recommended. In the table below you can see how the profit figures this would have made you to various starting points. For those of you wishing to play it slight safer, our recommended betting bank is 150 points, which will have returned a ROC figure of 155.7%. Steve Clark prides himself in running an easy to follow, functional and practical service so that as a subscriber to Top Dogs, you can get your bets on with the minimum of fuss. Bet Timing: The majority of bets are advised in the morning between 10am and midday, with only occasional bets advised slightly earlier or later than that. Most races take place in the evening, so there is always plenty of time to get your bets on. Number of Bets: You can expect an average of around 25 to 40 bets per month – depending of course on the quantity of value bets that The Dog Scientist uncovers. There is no ‘bet quota’ – tips are only supplied if it is a worthwhile punt. 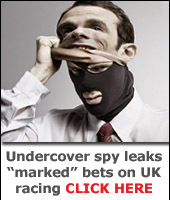 Staking: All bets are advised between 1 and 5 points via a clear staking plan. Bookmakers: Bets are only settled at prices available with the main bookmakers you find on Oddschecker. Personal Contact: As a member you will also get Steve’s personal email and mobile phone number to help answer any queries you may have on the service. Ensuring you are never left to fend for yourself! All subscribers to Top Dogs also get a free copy of an in-depth e-book written by Steve Clark called ‘Greyhound Wealth Secrets. Clocking in at 80 pages long, its fully a illustrated instructional blueprint crammed with tons of invaluable pointers, shortcuts and winning strategies. * A 7-step strategy that focuses on a certain race grade for profitabilty. * A cracking system from “The Dog Scientist” for finding premium dogs hidden amongst the also-rans. * The “old timer trouncer” laying strategy. * 4 dutching secrets to spread your risk and increase your winning potential. * The simple rule used by “The Dog Scientist” for spotting “liquid gold horses” – his best value selections. In order to showcase the service to as many of you as possible, Steve has put together a special 30-day risk-free trial of the Top Dogs service especially for SBC members. This enables you to sign-up today and if for any reason you are not happy with the Top Dogs service, you can get a full refund within your first 30 days. Not only do you get a 30 day risk-free trial when signing up for Top Dogs, but you can also save 50% on the cost of your first month with the service. If after your first month, you like the service, then Month 2 onwards will be charged at £39.95 + VAT on a monthly basis. You can cancel this at anytime, and remember if doing so within the first 30 days, you can get a full refund. If you are ready to get started with Top Dogs – you can sign-up via the special SBC member link below.